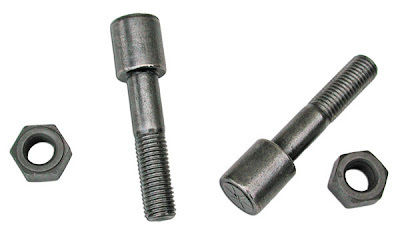 These Rear Leaf Spring Centering Bolts are certainly very unique parts. It is almost impossible to find used ones in good condition. They are now in stock, and they are exactly like the originals. Our leaf springs come with very similar bolts already installed, but the heads on the bolts are not as tall as the original ones. Now, the question is exactly what do these bolts do? Well, they obviously hold the leaves of the springs together, but they are really centering bolts. 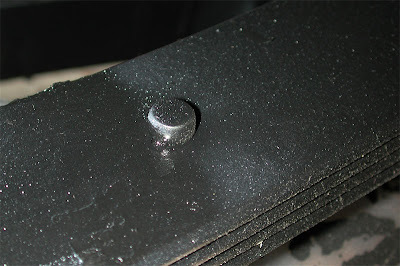 They just "center" the leaf springs to the pad on the rear end housing (see picture with arrow.) This "centering" is just that-they just center or "line up" the leaf spring assembly. They serve no major purpose in holding the springs in the Mustang. 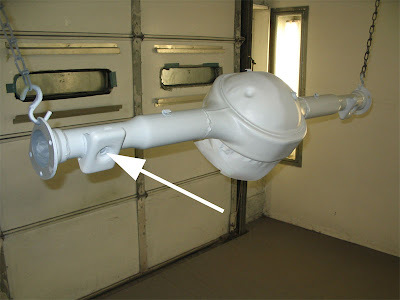 The front bolts, rear shackle kits and U-bolts do this job. Click here to order the bolts.